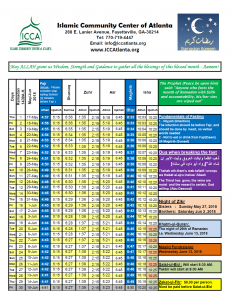 Please see the attached revised Ramadan Time Table for prayer times and schedule. A reminder that Taraweeh will start tonight, Wednesday May 16th. Isha is at 10:20 PM followed by Taraweeh inShaaAllah. Sign up for our free newsletter to learn about all the upcoming events at the ICCA. Your generous donations are significant to the advancement of the ICCA. We appreciate your continued support! © 2019 Islamic Community Center of Atlanta. All Rights Reserved.